Nero Burning ROM by Ahead is a versatile piece of software. It allows you to create Super VideoCD's with navigation menu's as well. In this short guide I'll show you how to create your own Super VideoCD, which you can playback on your PC and on most standalone DVD-players. Before you start you will need to have a proper MPEG-2 file (see formats for details) which you want to put on the Super VideoCD. Nero does support other MPEG and AVI formats but needs to convert these files to MPEG2 and usually the result is not that great. Note: Not all standalone DVD-player support Super VideoCD! Tip: It is also possible to add images (like digital photo's) to your Super VideoCD! Note: When using K(S)VCD templates, make sure to remove the check box at "Create standard compliant CD"!!!!!! Note: Read the disclaimer first! You will, naturally, need the movie file or files (you can put multiple movies or parts of movies on one Super VideoCD). The MPEG-2 should match the standard you want to target, ie. PAL or NTSC. Preferably use PAL since the resolution of a PAL movie is slightly better than that of a NTSC movie and most stand-alone players seem to be able to playback PAL and NTSC mixed anyway without any trouble. Make sure you test this first with your DVD player! In this test you can also see if your standalone player can handle CDR and/or CDRW discs. Some older DVD players cannot read CD-Recordables, instead try a CD-ReWritable disc since the laser reflection of these discs almost matches that of a regular DVD. Make you choice now and remember the info of these tables above. Note: Audiobitrate is not fixed to 224 kbps, however it is advisable to use this format. Lower bitrates take less space but quality is poor. Higher bitrates renders better sound quality but some DVD players might experience trouble with these VCD's ... if you have to select a higher quality, the go for 320 Kbps. OK, now we have the movie file, we will start Nero. 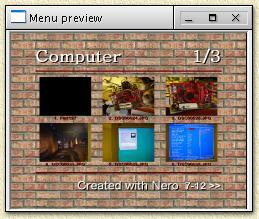 Nero usually starts either with the Wizard window or with the "New compilation" window. click the "Close Wizard" window so Nero will bring you to the "New Compilation" window. either select "File" from the menu and choose "New..." or click the "New Compilation" button ( ). In the "New Compilation" window we now select the "Super Video CD" icon as shown here on the right, which will open the options for our new VideoCD. For the rest of this tutorial I'm assuming you're about to make a PAL VideoCD. The only differences with an NTSC VideoCD is the option "NTSC" instead of "PAL" and the MPEG2 movie format used as mentioned above. Click the tab "Video CD" if this is not the currently displayed tab. For you're first VideoCD I'd like to suggest to use the settings as seen above. NTSC users might want to check NTSC instead of PAL. Now go to the next tab, called "Menu". Since we are about to create a Super VideoCD with menu's, please check the option "Enable menu". Tip: first you might want to check the "Preview first page" option. It shows a little window with a preview of the menu (changes are implemented right away!). This window is sizeable so you can see a bit more of the details. Enable menu Enable or disable the menu. Layout Here we can define how Nero should layout the menu. Either using text (titles) or thumbnails. Examples are shown below. Header line Enable or disable the horizontal line above the titles or thumbnails. Footer line Enable or disable the horizontal line just below the titles or thumbnails. Background picture Here you can indicate what image you wish to use as a background. If you don't enter anything here, the background will by default be black, You can change that color by clicking the little black square next to the "Browse..." button. Header text Here you can enter the page title. You can leave it empty if you don't want a title. The button "Font" allows you to choose font, style and color. The option "shadow" creates a shadow behind the text. When activating this option, a little black square appears allowing you to set a different color for the shadow. Footer text Here you can enter the footer text. You can leave it empty if you don't want a title. Items text This option allows you to set font, style and color (note that the color settings influences the color of the horizontal lines as well!) vof the titles of the menu items. Here you can activate the use of shadow as well - the shadow will also be applied to the thumbnails and the horizontal lines. Links text Here we set font, style and color for the indicator in the lower right corner showing the user that there are more menu pages. The shadow thing works as with the previous items. Set as default Allows you to make Nero save these settings so the next new Super VideoCD will be started out with the same settings - ideal when you are creating a serie of Super VideoCD's.. Preview first page Allows you to preview the menu. You can also create a Super VideoCD without a menu, see "CDRW - Super VideoCD's with Nero" for details. NO other option should be checked! Now we go to the tab "Label". In the field "Volume label" we can now enter the title of our Super VideoCD. Usually it's a straight forward name. Tip: If a movie spans multiple VideoCDs I usually end the title with "_AOFB" where A equals the disc number in the sequence and B equals the number of discs in this set. In the volume label, special characters like "/", "\" and a space are not allowed. It is common practice to use an underscore ("_") as a replacement of the space character. Dates can optionally be set at the "Dates" tab. I usually set the date here to "Use current date and time" for my personal reference, however the default setting will do just fine. Alternatively you can enter a specific date indicating for example that this is the movie of your holiday of June 2001. At the "Misc" tab we do not need to set anything. The "Burn" tab is not an issue right now either. Finally click the "New" button. After we clicked the "New" button, this compilation windows will appear. Use drag and drop to place a movie file (MPEG2, either with MPG or MPEG file extension) as shown below. Drag and drop can be used with the buildin explorer of Nero or using the Windows Explorer (by draging a file from the Windows Explorer to Nero). Note: Other formats are supported as well - Nero will transcode/convert these files. Just ckeep in mind that the quality might be disappointing! In the right pane you click through the discs of your computer as you would do with the Windows Explorer. When you finally found the file or files you want to add, use the left mouse button to select that particular file and keep the left mouse button pressed. Now move your mouse until is is positioned over the pane part pointed with the red arrow in the screenshot below. Once the mouse is at that position, you can release the mouse button and Nero will add the file. You can add as many movieparts as you like. The order shown in the window pointed by the red arrow as seen in the screenshot above, will be the playback order of your movies. You can change the order using drag and drop within this little window. Not advisable, but then again most DVD players seem to be able to handle VCD's that are not 100% Super VideoCD compliant. The buildin transcoder can convert the file (not the orginal one) to the proper VideoCD specifications. Yes even a DivX will be transcoded to MPEG-2. Warning: The QUALITY of this transcoded file might be rather poor! This is what I would do and use some tool to transcode it to the proper format. A proper tutorial on this subject will follow soon. A Super VideoCD can hold more data on a CD than a regular CDRom. This is due to the different level of error correction. A 80 minute CDR can hold app. 810 Mb of VideoCD data. So the indicators (the yellow and red dotted lines in the progress bar) are not indicating the proper capacity. Sometimes it can be usefull to do some corrections on the menu as it has been created by Nero. For example: to change the fact that a menu automatically continues to the next menu after 5 seconds. Click such an item with the right mouse button and select the option "Properties" from the popup menu. We can set the "pause" time before the menu continues to the next menu page. 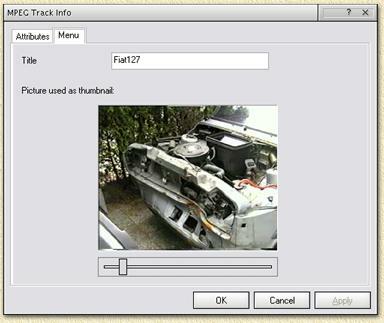 At "Pause after Track" one can choose "Infinite", where the menu does not continue to the next menu unless the user tells him to do so, or a specified number of "Seconds". We can set the "pause" time before the playback continues with the next movie. At "Pause after Track" one can choose "Infinite", where playback does not continue to the next movie unless the user tells him to do so, or a specified number of "Seconds". The tab "Menu" allows you to change the title and also the thumbnail image used for this item. OK, now we've made our compilation, it's time to burn that puppy. Click the "Burn" icon ( ) or click in the "File" menu, the option "Write CD ...". The "New compilation" window appears again, this time showing the "Burn" tab. "Finalize CD (No further writing possible!)" Finally click the "Write" button and wait for the CD to complete. After the CD has been completely burned, you can try it on your PC using (for example) PowerDVD, or play it on your standalone DVD player to see if it all works. For playback on a PC you MUST have a software DVD-player like PowerDVD - Windows Media Player will playback MPEG2 files, unless you have a software DVD-player installed. The MPEG2 files can be found in the folder "MPEG2" of your Super VideoCD and the first file is usually called "AVSEQ01.MPG".